Sun’s out buns out with this DIY mermaid salt scrub that will leave your skin absolutely glowing from head to toe! 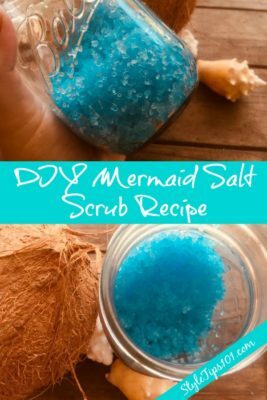 Made with all natural ingredients, this DIY mermaid salt scrub will exfoliate even the roughest of skin all the while hydrating dry skin, and leaving it with a beautiful sheen that you’ll wanna flaunt all summer long! And the best part of the salt scrub? 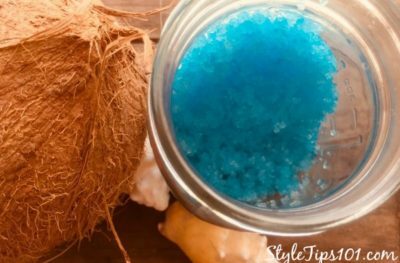 Aside from the fact that it looks absolutely fabulous and will channel your inner Ariel, this DIY mermaid salt scrub is DIRT cheap to make! 1 cup sea salt (coarse or fine) coarse sea salt is great for those with oily skin, while fine sea salt is better for those with sensitive, dry skin. 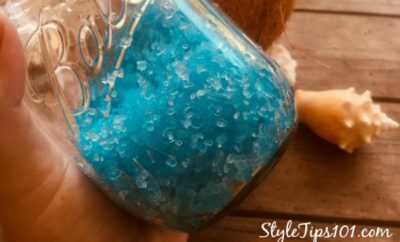 1 drop blue food coloring (optional) if you choose to forego the food coloring, your DIY mermaid salt scrub will just be white! In a medium sized bowl, mix all ingredients together until well combined. Scoop into a clean, airtight jar. In the shower, rub the scrub onto wet skin and scrub in slow, circular motions. Focus on rougher parts such as elbows, knees, and feet. Use twice a week to get clear, soft, glowing mermaid skin!